Who doesn't enjoy a good possession? Cruel demons inhabiting the bodies of innocents are a regular horror staple, but there's not actually much exorcism going on in Diederik Van Rooijen's slick but stale genre piece. A pre-credits scene introduces Hannah Grace (Kirby Johnson) as she spider-walks, levitates and impales a couple of priests, but the rest is a rather different film, a slow-burner set in the morgue of the Boston Metro Hospital. 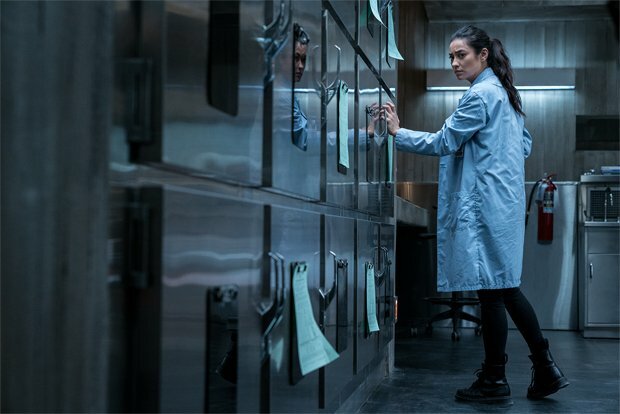 While starting her new career on the night-shift in the mortuary, Megan Reed (Pretty Little Liars star Shay Mitchell) encounters Hannah Grace when the girl's dead body is delivered by ambulance. As a vigilant ex-cop, Megan notices several odd things about Hannah, not least that she regularly appears wandering the corridors on CCTV and is also rapidly murdering the staff one by one. Is Hannah's rampage just a hallucination brought about by post-traumatic stress, or is there really an other-worldly force at work? The BBFC's warning of 'strong supernatural threat' quickly tips unwary audiences a wink that this is a straightforward horror film, elevated to watchability by Mitchell's solid performance and by the striking appearance of the morgue, with huge, stark, modern corridors that whip up an atmosphere laden with dread. Unfortunately, there are no surprises in Brian Sieve's script, just jump scares, dream sequences to pad out the runtime and many illogical gaps, namely Hannah's tension-deflating ability to be in several places at once. Coming on the back of the pretentious everything-but-the-kitchen-sink stew served up by the Suspiria remake, The Possession of Hannah Grace offers rather more old-fashioned body horror; crunching bones and tearing flesh are effectively rendered, yet expectations of cheap thrills drain away as the scares fail to materialise.